This personalized, custom-made rubber stamp is just the right touch for identifying all your photographs. Attractive, easy-to-read script letter style offers clean, sharply defined imprints. the very best impressions over the years, be sure to order a bottle of StazOn Cleaner. and the impressions don't look as good as they should. in the space provided below. It's just that easy. We make your personalized rubber stamps without delay. 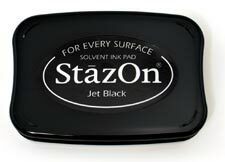 Most rubber stamp orders normally ship within 24 hours! This product was added to our catalog on Tuesday 17 August, 2004.